The Iraq war was the subject of news today both in the UK, with the release of the Chilcot inquiry, and in the US with news reports of Donald Trump praising Saddam. David Weigel made a point that the media’s coverage of Trump’s statements appeared timed to help Hillary Clinton after the Clinton campaign used them to distract from James Comey’s statement which accused Clinton of being extremely careless with classified information, and demonstrated that she has lied to the public on several key points regarding the email controversy. Missing from the mainstream media coverage was Clinton’s support for the Iraq war based upon false claims. A long-awaited official inquiry delivered a devastating indictment of Britain’s decision to invade Iraq Wednesday, finding that the war was based on flawed intelligence and had been launched before diplomatic options were exhausted. 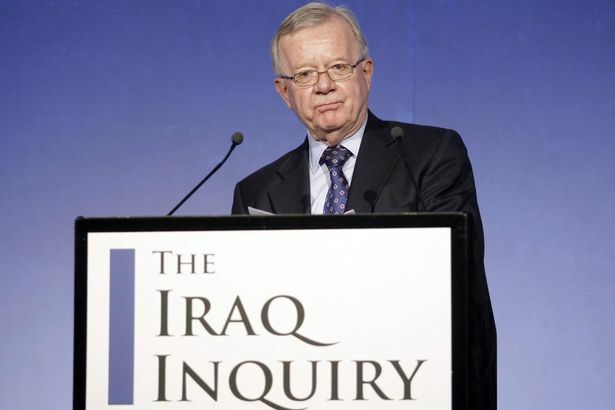 The findings of the 2.6 million-word Iraq Inquiry — seven years in the making — were released following a statement by probe chairman John Chilcot in London. The former civil servant said that Iraqi dictator Saddam Hussein posed “no imminent threat” when the U.S-led invasion was launched in March 2003, and that while military action against him “might have been necessary at some point,” the “strategy of containment” could have continued for some time. Chairman Sir John Chilcot said the 2003 invasion was not the “last resort” action presented to MPs and the public. There was no “imminent threat” from Saddam – and the intelligence case was “not justified”, he said. While acknowledging that Saddam Hussein “was a bad guy,” Trump praised the former Iraqi dictator’s efficient killing of “terrorists” — despite the fact that Iraq was listed as a state sponsor of terrorism during Hussein’s time in power. Trump, who supported the Iraq War before the invasion and in the early months of the war, said the U.S. “shouldn’t have destabilized” Iraq before pivoting to praising Hussein. “He was a bad guy — really bad guy. But you know what? He did well? He killed terrorists. He did that so good. They didn’t read them the rights. They didn’t talk. They were terrorists. Over. Today, Iraq is Harvard for terrorism,” Trump said. The point is that Trump has been saying, for quite some time, that the United States should not have gone to war in Iraq, and that it should side with dictators as long as they “kill terrorists.” The Republican primary electorate endorsed that view. Clinton, as a senator and then as secretary of state, took another view, and backed the use of American power to remove both Hussein and Libya’s Moammar Gaddafi. There’s video of Clinton gleefully saying “We came, we saw, he died” upon learning that Gaddafi had been torn apart by his own people. This has never been treated like a gaffe; but Trump’s “Saddam killed terrorists” riff suddenly is. By consistently covering Trump’s argument over time, and by following up on it, media outlets did their job to inform voters. That was why Tuesday night’s collective Captain Renault moment was so strange, and so demonstrative of why many media consumers are skeptical of what they’re hearing. Instead of a debate on the facts — should Hussein have been removed? Did he “kill terrorists,” in a contradiction of what Americans were told before the war? — there was manufactured outrage, straight from a rival campaign. The media coverage certainly has helped Clinton, in both stressing the worst aspects of Trump’s views and in totally ignoring how strong a supporter of the war Clinton was. Not only did Clinton support the war based upon the faulty intelligence cited in the report, she went beyond the claims of many supporters of the war in falsely claiming there were ties between Saddam and al Qaeda. Clinton’s support of neoconservative regime change has been a disaster. However Trump also has himself to blame. As on so many matters, even in criticizing Clinton where she deserves criticism, Trump has failed to make a consistent coherent argument against her, with the media further assisting Clinton.